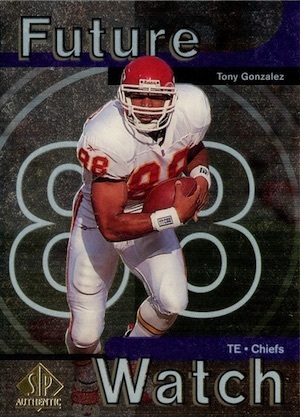 As the football debut for the popular Upper Deck line, 1997 SP Authentic Football did not have the benefit of a built-in audience, but the premium brand quickly made its mark on the hobby. 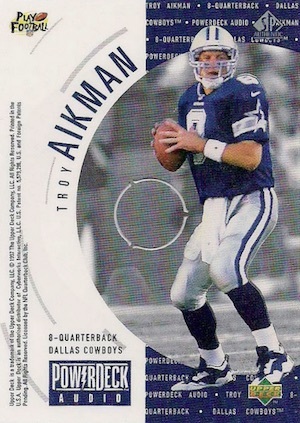 Although the 1997 edition cannot match the star power of Peyton Manning's rookie card the next year, several key condition-sensitive rookie cards drive the release. Leading off the 198-card foil base set, Future Watch rookie cards command much of the collecting interest in 1997 SP Authentic Football. 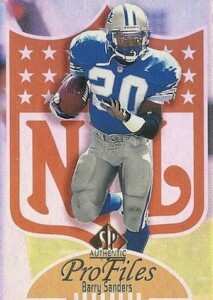 Although glamour offensive positions, like rookie cards for quarterback and running back, normally dominate football products, '97 SP Authentic is the exception. 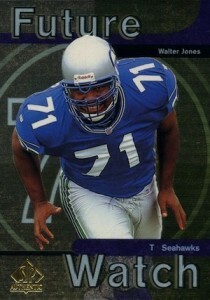 Chief among these are rookies for Orlando Pace, Tony Gonzalez and Walter Jones. 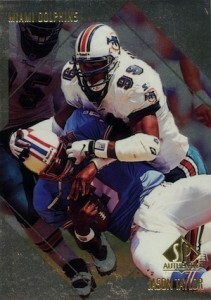 A set headlined by cards for offensive lineman and tight end rookie cards is certainly a rare sight. Featuring a bold design, the first 30 cards in the 1997 SP Authentic Football base set cover the full Future Watch subset and then the traditional base set takes over. Although the base design showcases more of the background image, there is still plenty happening on these fragile cards. Despite the face that some of the most popular names are found at the beginning of the checklist within the Future Watch subset, notable rookie cards are also found throughout the set with the base design. 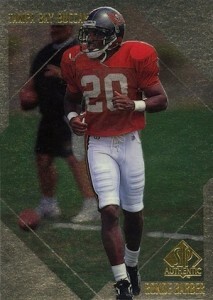 Jason Taylor, Tiki Barber and Ronde Barber are other top rookie card options found in 1997 SP Authentic Football. Drawing the most interest outside of the rookie cards, on-card autograph inserts and memorabilia redemptions offer several limited hits. In case it is not clear, all redemptions expired many years ago. 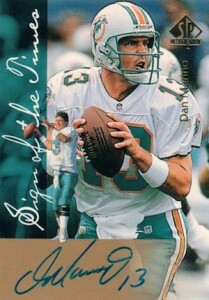 Sign of the Times are the most common autograph options, averaging one per box. The SOTT design is also shared with Marks of a Legend and both are hard-signed. 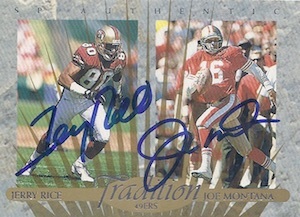 One of the toughest pulls in 1997 SP Authentic Football, Tradition dual autographs pair two greats on a single card. Among the inserts, ProFiles is the main set and is broken into three tiers. 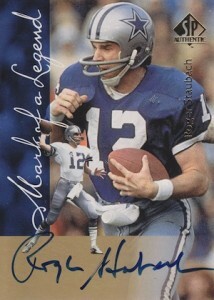 In addition to the base design, there are two die-cut versions, with the rarest numbered to 100. Perhaps the most intriguing card in the set, PowerDeck Audio inserts are card shaped but can be played like a CD to reveal exclusive audio. 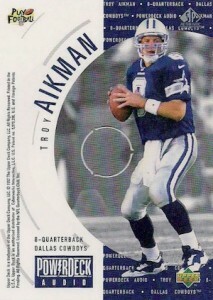 Troy Aikman is the sole focus of the insert line with three levels of rarity. 198 cards. Shop for base sets on eBay. Short prints are noted below. Some players have multiple versions.